Treatment is a work not only for doctors, but also for patients, and its effectiveness depends on their co-operation. No single medicine can help if you do not take it on schedule, and without tests results you will not be able to monitor the condition. The patient support system will give you detailed information about your illness, possible complications and help organize the treatment process. Using the Qapsula support system will empowers you to control the disease on high quality level. The system is made as a number of programs for patients, containing the entire complex of actions necessary for prevention and treatment of many different diseases. They are all based on the largest scientific researches and clinical recommendations and are made by experienced practicing doctors. 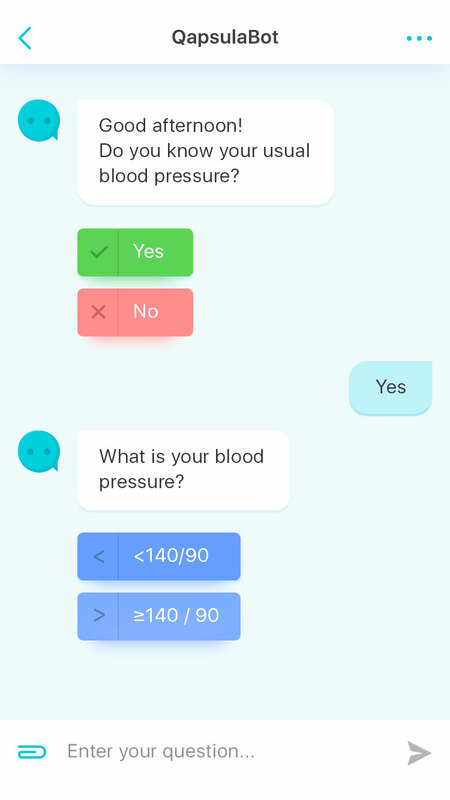 The program analyzes various parameters of the body and with the help of the chat-bot gives all the necessary information, suggests a plan of actions to increase effectiveness of prevention and treatment. How it can help patients? We all know that it can be difficult to undergo treatment. The process of treatment often requires responsibility and even diligence. Take medicine, measure blood pressure, do not forget about morning exercises, submit to necessary tests on time and visit a doctor - all this is very important to be done, but can be difficult to keep in mind. This Is where patient support system Qapsula will help you out. It will provide you with all the necessary information about your disease and medications and will always help to keep in touch with your doctor. How it can help doctors? In modern world there has been a shift from the paternalistic relationship between doctor and patient to relations based on cooperation and partnership. We all understand that, first of all, treatment is patient’s responsibility, and doctor only gives advice and helps guide the patient. After all, no doctor can constantly be nearby patients and monitor how they comply with the orders, how many times a week do sports and what they eat. Time-consuming queues in a doctor\'s office or inconvenient location of the clinic - the patient will always find an excuse to miss a visit to the doctor. Patient Support System Qapsula allows you to communicate with patients online easily and effectively and help them actively manage their treatment. With its help you can always receive recent data and monitor their condition and progress. Quickness and convenience of such interaction will help to overcome distance barriers and time issues, make the treatment process easier and more accessible, and thus increase its effectiveness.